"This is our home, too. Our Lady is always with us. We also are children of God." Nashville has a new church named after Our Lady of Guadalupe. Yesterday's story featured excerpts of Tim Chavez's editorial on the welcoming role of the church. Today, thanks to the generousity of Hispanic Link, we publish the editorial in its entirety, below. My mother married my father more than a half century ago in a church dedicated to Our Lady of Guadalupe. 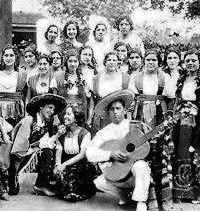 It was located in a Topeka, Kansas, barrio populated with a growing number of Latinos recruited to fill meat-packing jobs and keep the Atchison Topeka & Santa Fe Railroad running across this nation. Every U.S. city that realizes a critical mass of Hispanics, especially mexicanos, will be home to a Catholic church dedicated to La Virgen de Guadalupe. Venerated as a protector, she appeared in 1531 near Mexico City to an Indian boy, Juan Diego. A great cathedral stands there now. Such deep faith has always been a defining characteristic of Hispanics. That faith has been recognized now in Nashville with the opening of Our Lady of Guadalupe Catholic Church. Amid the ongoing onslaught against immigrants – particularly in the South – this bodes well for more sane discourse and decision-making in 2008. A spectacular dedication mass spotlighted our rich culture and history in this city. Our children clutched bouquets of roses to put before a giant painting of the Mother of God. Our families showcased the youthfulness of a workforce that will increasingly serve this country’s welfare and defense as Baby Boomers retire. I sat in the pews with my brothers and sisters from another country who risked so much to come here and put their futures in God’s hands. At no time has this kind of faith been more needed. In the South, Hispanics are being targeted physically. There is a 1-in-11 chance they’ll be pulled over on Tennessee state highways and interstates. That compares to a 1-in-19 chance for whites and blacks, a Nashville TV station reported. Some county sheriffs are making a priority of rousting job sites of undocumented workers. Once the lack of needed documents is discovered, immigrants are held for federal authorities. Against this backdrop, the year concluded on a hopeful note. The location of Our Lady’s church is perfect. It’s on a primary traffic artery where Hispanics have revitalized the neighborhoods and the business community after locals moved to the suburbs. The church will be more than a place to worship. It will be a visible English-language education and cultural center. An unlikely partnership came together to make this miracle happen. The primary mover and shaker is a blue-eyed Irish-American priest who speaks barely a word of Spanish. But this Nashville native used his bully pulpit and reputation to remind members of his congregation at nearby St. Edward Catholic Church that it’s payback time. Father Joseph Patrick Breen continually preaches about our immigrant history. He reminds his parish – and Nashville – that others were here to help the Poles, the Italians and the Irish to set up their own churches and institutions. There has never been a Statue of Liberty on the Rio Grande to greet Hispanic newcomers. By naked conquest, migrants from the East took over the richest lands Mexicans originally inhabited from Texas to California. For the past several years, St. Edward has opened its doors to more than 1,300 Latinos at two extra masses. But Father Breen knew more was necessary. In a matter of months in 2007, the mostly white congregation responded. Our Lady’s church is located in a Baptist church that closed after losing much of its congregation to the suburbs. Property owners agreed to sell it and its school buildings for a third of their appraised value. Of a total $1.5 million in total costs, more than $600,000 has been raised. My father is gone now. When he returned from World War II, Mexicans were still segregated in a roped-off section of pews in the Catholic church of his rural Kansas hometown. But an Our Lady of Guadalupe church in nearby Topeka welcomed my parents and offered them simple respect as they began their union and family. Our Lady brings hopeful momentum into 2008 and a reminder to this nation of a moral obligation to its immigrant history. Text copyright 2008 by Hispanic Link. Used with permission.